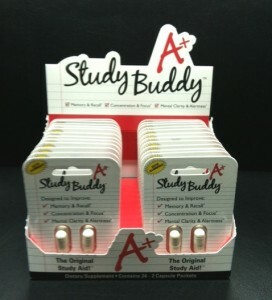 Study Buddy | A Case Study by Assemblies Unlimited, Inc.
Study Buddy had a dietary supplement #00 capsule and wanted to retail them in a 2 ct blister card, then into a counter display for easy shopping. Brainiac Supplements, LLC found Assemblies Unlimited online and saw images on their website of a 2 ct carded blister that got their attention. This new trap blister packaging style along with a glossy UV finish created the perfect presentation for the 2 capsules compared to the old flexible pouch option. Assemblies Unlimited also redesigned the counter displays to include a die-cut insert which managed the cards to look “organized” and stand vertically in the display for easy access. Through the expertise and component supply management of Assemblies Unlimited, a new high-end look in an attractive display was created which increased sales of the product at college bookstores, C-Stores and retail store levels. Customer is ecstatic over the upgrade in the product packaging and that all the manufacturing deadlines were met. Once again, good communication, design support and deep knowledge of packaging trends by Assemblies Unlimited all played a huge role in the success in this dietary supplement retail packaging project.